The trick of putting a paper towel in with your salad lettuce will keep it fresh all week long. 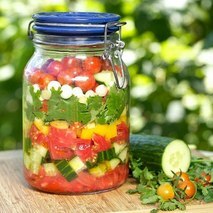 Tomatoes, cucumber slices, sprouts, spring onions and Parmesan shavings and other favourite salad ingredients. You could make one large salad or individual servings or do what I’ve taken to doing recently and serve a large variety of salad ingredients for people to make their own. I served this salad with a Sweet Chili dressing made by combining 150ml sweet chili sauce, 50ml vegetable oil and the juice of a lime. recipe than our colorful Best Layered Broccoli Salad. A great recipe for a potluck, it has crisp broccoli florets with sunflower seeds and bacon to contrast the sweetness of the dried cranberries. A refreshing salad that will go with just about any meal, treat yourself to this layered masterpiece. Oh, and we almost to forgot to mention the loads of cheese added on top. It doesn't get any better than that. 1.In a large glass bowl, layer the broccoli, onion and cranberries. 2.Combine the yogurt, mayonnaise, honey and vinegar; drizzle over salad. Sprinkle with cheese, sunflower kernels and bacon. Pour over Fresh Romaine Lettuce and top with Freshly grated Parmesan Cheese, More Fresh Pepper and Home Made Croutons. Heat a large saute pan with 2 tablespoons of olive oil until very hot. Lower the heat to medium-low add the butter and saute the bread cubes, tossing frequently, until nicely browned, 8 to 10 minutes. Add more olive oil, as needed, and sprinkle with 1/2 teaspoon salt and 1/4 teaspoon pepper. Let cool and add to salad. I save some for the next day, too as this made a lot. In large bowl, stir together all ingredients until well mixed, adding salt and pepper to taste. Serve immediately, or store in a tightly covered container for up to 24 hours in the refrigerator. This recipe is quite versatile! For a slightly different flavor, swap out the grapes, cashews and lime juice for cucumbers, sliced almonds and lemon juice. 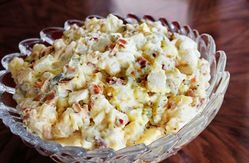 This recipe can be served immediately, or stored in a tightly covered container for up to 24 hours in the refrigerator. Mix all ingredients and stir together, enjoy! IN A DRY SKILLET JUST A FEW MINS ON MEDIUM UNTIL FRAGRANT AND STARTING TO BROWN. BOUGHT CHICKEN AND SHRED/CUT INTO BITE SIZED PIECES. ADD A LITTLE BIT OF MAYONNAISE, SALT, PEPPER AND STIR. Combine cabbage, onion, and 1 cup carrot in a large bowl. Combine white wine vinegar, sugar, mustard, mayonnaise, salt, black pepper, and red pepper in a small bowl; stir well with a whisk. Add the mustard mixture to cabbage mixture, and toss well to coat. Cover and chill for 20 minutes. Stir before serving. 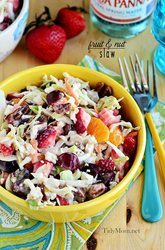 KFC coleslaw is one of my all-time favorite foods, After doing some research I found this recipe and I have made it in the past and it is absolutely delicious! It tastes exactly like the stuff KFC makes! 1 Shred the cabbage fine using the fine disk for the shredder attachment to the mixer. Shred the carrot the same way. Mix together cabbage, carrot and onion. 2 In a bowl combine the buttermilk, mayonnaise, milk and lemon juice with a whisk until well combined. Add the salt and pepper. Add the sugar to the sauce until well mixed in . Add the sauce to the cabbage and carrot mixture and mix well and allow the mixture to marinate for 13 hours in the refrigerator. 3 I have used Splenda sweetener in the place of sugar, and it was great. over low heat until gelatin dissolves. Remove from the heat. with cooking spray. Chill overnight. if using a ring mold. 1. Mix together the sauce and mayonnaise. Pour over the eggs and chill thoroughly. 2. Meanwhile, heat the garlic bread or shallow-fry the Hash Browns. 3. 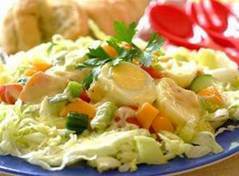 Just before serving, gently combine the prepared vegetables and peaches with the eggs and sauce. Serve immediately. 1. Using a large bowl, combine shredded cabbage, strawberries,oranges. grapes, pecans and blue cheese. 2. Add Slaw Dressing and gently stir until all ingredients are well coated with dressing. Place ingredients in a jar in pretty layers. Blend in a blender with tomato juice as desired for taste and consistency and seasonings to taste as desired: salt, pepper, lime or lemon juice, cayenne pepper sauce. Cornbread salads are a true favorite here in the South. This variation has sort of evolved through the years in my kitchen because of our love of spicy foods, Southwestern and Tex-Mex flavors. 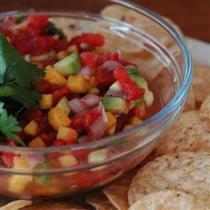 The fresh pico de gallo, is a must and takes my salad over the top. It also stays true to the type of food that inspired my take on this classic. 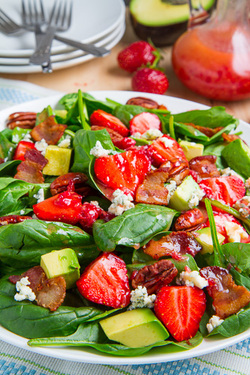 This salad needs to be made ahead to allow the flavors to fully develop. 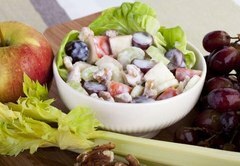 If you plan on serving this salad for dinner, it can be made during early morning for the best same day results. Otherwise, overnight is ideal for the full impact and flavor combination to shine. Prepare the cornbread per the instructions on the package and cool. Divide into thirds. 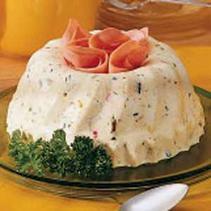 Prepare the dressing using 1 1/3 cup of milk/buttermilk and 1 cup of mayo, then chill until assembling the salad. This is slightly more milk than called for on the package, but, I prefer the dressing a little thinner for this salad. 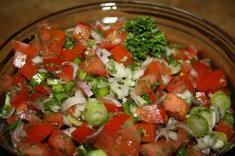 To prepare the pico de gallo, dice the tomatoes, onion, and jalapeno pepper. If you like your salsa super spicy, leave the seeds in the jalapeno, otherwise, use a teaspoon and remove them. Always wash your hands well after handling hot peppers. Add to a bowl, and toss with the chopped cilantro, lime juice and seasonings. If making ahead, place into the fridge and chill until you assemble. If you're using canned corn, drain the Mexican corn and black beans, and rinse the beans thoroughly. Mix together. If you're using frozen corn, cook according to the package directions and cool before tossing with the black beans. 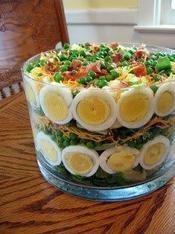 To assemble the salad, I use a trifle bowl, simply because the colors are so pretty, it adds to the presentation. Gather all of your ingredients to help the layering process move along smoothly. Divide the ingredients in thirds. 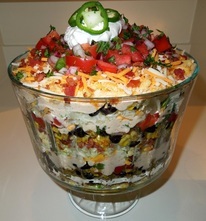 Layer in this order...shredded lettuce, crumbled cornbread, bacon, Mexican corn and black beans, pico de gallo, dressing and shredded cheese. Repeat until all of the ingredients are used. For the top, I reserve some of the pico de gallo, bacon crumbles, and cheese to garnish. So, theoretically, there are four layers of pico, bacon and cheese in my salad, but, whose counting? ☺ I'm pretty generous with the dressing when assembling my salad, so I use plain sour cream dolloped on top as a garnish. When serving a salad that includes spicy or hot peppers, I always try to place a few visible as a garnish, letting people know what's inside of the dish. So, a few rounds of jalapeno are placed on top of the sour cream for the finishing touch. 1. 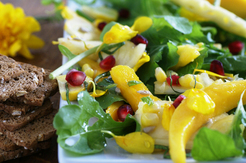 For Dressing – Fry the pineapple in the oil for about two minutes. 2. Add the vinegar + honey + ginger + mint + salt and let it simmer for about 5 minutes. 3. Lastly add the lemon zest – let it cool down and serve with salad. 4. For salad - mix ingredients together and serve with dressing. In a medium bowl, combine the tomatoes, jalapeno, green onion, sweet onion, cilantro and garlic. In a measuring cup, stir together the lemon juice, lime juice, sugar, coriander, cumin and salt. Stir until the sugar and salt dissolve, and then pour over the tomato mixture. Transfer to a serving bowl, cover, and set aside for at least 1 hour to allow the flavors to meld. In a medium bowl, combine the peach, avocado, tomatoes, habanero, cilantro, and garlic. Stir in the salt, lime juice, red onion, and olive oil. Add the potatoes to a pan of boiling water and parboil for 5 minutes. Drain thoroughly and transfer to roasting tin. Cut the onions into wedges. Add to the roasting tin. Drizzle over 4 tablespoons of the olive oil and roast for 45 - 60 minutes, or until the potatoes are tender. Heat the remaining oil in a large pan and fry the Eskort Streaky Bacon until crisp. Add the red wine vinegar to de-glaze the pan, pour over the potatoes and toss to coat, or wrap each potato with a strip of bacon for a pretty effect. Season with sea salt and finely chopped rosemary. Make salad a day in advance and keep refrigerated. Serve as a side dish to a braai. Mix all the ingredients except the hard boiled eggs and chopped parsley together in a serving bowl. Lastly top with quartered hard boiled eggs and chopped parsley. 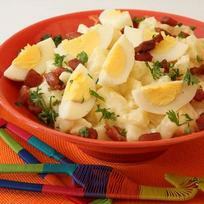 Chop the eggs and potatoes to the sizes you like and put them in a large bowl with the cooked onion and mix. In another bowl mix together mayo, ranch, relish (pickles), mustard, salt, pepper, paprika, and celery seed. Pour the the mayo/ranch/spices mix in with the eggs and potatoes and mix to combine. Right before you serve it mix in the bacon. This will ensure the bacon is still crispy. Peel and dice potatoes into cubes. Place potatoes into a large pot of water. Boil for about 20 minutes (or until fork tender). Take care not to overcook your potatoes – you don’t want them overly mushy. Mix mayonnaise, vinegar, mustard, chicken stock and salt and pepper in a large bowl. Add potatoes, celery, onion and stir gently. Cover and refrigerate at least 4 hours to blend flavors and chill. 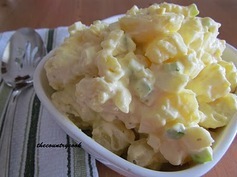 Add a little more mayonnaise and chicken stock and it will restore the creaminess of your potato salad. Boil the potatoes in water until just fork tender, about 15-20 minutes, drain and let cool completely. Meanwhile cook the bacon and set aside on pepper towels to drain. Mix everything and optionally, though highly recommended, let it chill in the fridge to allow the flavours to mingle before serving. Option: Replace some of the sour cream with mayonnaise. MY NEWEST LUNCH OBSESSION!!!!! Utterly brilliant, people. non-salad eaters (me) to mow down daily. You can make any arrangement you want… you can add red onion, cucumbers, radishes or peppers. Always remember to put the dressing at the bottom and the lettuce at the top—a MUST. 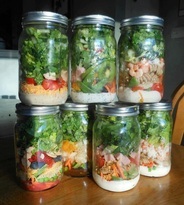 NOTE* If your making a few salads at a time for the week, you MUST remember to vacuum seal the Mason Jars. IF YOU ARE A SALT-A-HOLIC, YOU WILL LOVE THIS! DRIZZLE WITH EVOO & BALSAMIC, TOO! In a 9×13 inch pan layer the lettuce followed by the peas, green pepper, cauliflower and celery. In a small bowl combine the mayonnaise and the sugar. Spread mixture over salad. Seven Layer Vegetable Salad is ready to serve. 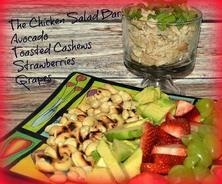 Assemble salad, toss in dressing and enjoy! Option: Goat cheese or feta also work well in place of the blue cheese. Option: I like to throw in some fresh peas when available in spring. Mash the raspberries and mix everything. Option: Replace the white balsamic vinegar with dark balsamic vinegar, apple cider vinegar or raspberry vinegar. Break noodles up while dry. Soak noodles in boiling water with flavouring for 2-3 minutes. Drain. Slice cabbage, shallots and celery finely. Mix together all dry ingredients except sesame seeds and black pepper. Mix together sugar, vinegar and olive oil until sugar dissolves, stir through dry ingredients ensuring all are coated well. Sprinkle sesame seeds over the top of salad, and gring some black pepper over it also. You will also need: a paring knife, chopping knife, measuring cups and spoons, salad bowl, cutting board and a small bowl. 1. Wash apples. Cut into cubes, enough to make 2 cups. Put in salad bowl and squeeze juice of lemon over the apples. 2. Wash and scrape celery. Chop in small pieces enough to make 1 cup. Add to apples. 3. Add pecans, sugar and salt to apples and celery. 4. 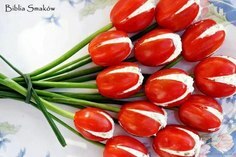 In a small bowl, mix the whipping cream with the mayonnaise. Add to salad and mix gently. 5. Chill. Serve in crisp lettuce leaves.